The speed sensor detects the wheel speed and sends the appropriate signals to the skid control ECU (master cylinder solenoid). These signals are used for brake control. The speed sensor rotors have rows of alternating N and S magnetic poles and their magnetic fields change when the rotors turn. Each speed sensor detects that magnetic change and sends a pulse signal to the skid control ECU (master cylinder solenoid). At a vehicle speed of 10 km/h (6 mph) or more, the output voltage from one of the speed sensors is less than that from the other sensors for 15 seconds or more. At a vehicle speed of less than 10 km/h (6 mph), the output from one of the speed sensors is 0 km/h (0 mph) for 1 second or more. At a vehicle speed of 10 km/h (6 mph) or more, the outputs from both front speed sensors are 0 km/h (0 mph) for 30 seconds or more. 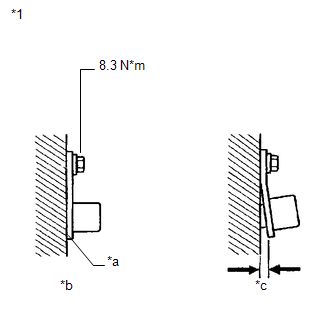 DTCs C1401 and C1271 are for the front speed sensor RH. DTCs C1402 and C1272 are for the front speed sensor LH. (a) Remove the front axle with ABS rotor bearing assembly (See page ). (b) Check the speed sensor rotor. The front speed sensor rotor is incorporated into the front axle with ABS rotor bearing assembly. If the front speed sensor rotor needs to be replaced, replace it together with the front axle with ABS rotor bearing assembly. (f) Check that there is no difference between the speed value output from the speed sensor displayed on the Techstream and the speed value displayed on the speedometer when driving the vehicle. Factors that affect the indicated vehicle speed include tire size, tire inflation and tire wear. The speed indicated on the speedometer has an allowable margin of error. This can be tested using a speedometer tester (calibrated chassis dynamometer). For details about testing and the margin of error, refer to the reference chart (See page ). (a) Replace the front speed sensor (See page ).